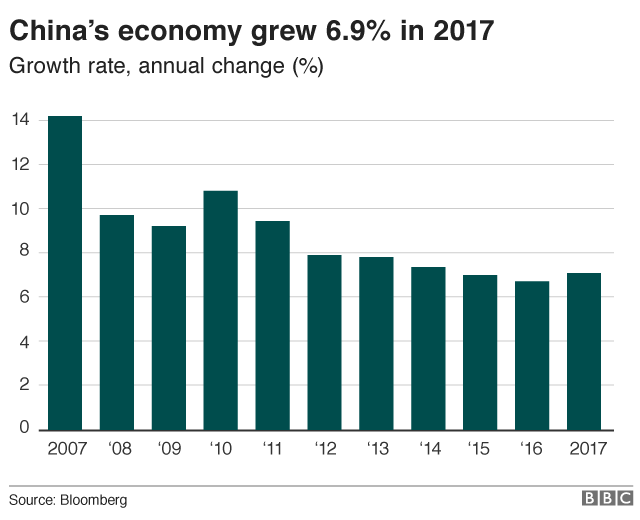 China’s economy grew by 6.9% in 2017 according to official data — the first time in seven years the pace of growth has picked up. The numbers released on Thursday also showed that in the last three months of 2017, the economy grew at an annual rate of 6.8% — slightly higher than analysts had been expecting. First, it looks like stronger exports — as the world economy picked up — and the final sputter of (another) government infrastructure investment spurt helped make 2017 better than expected. But that’s the model China is trying — gently — to get away from. Beijing meanwhile says it has been taking steps to contain risky debt despite the impact that might have on economic growth — efforts the IMF said it recognised. The government has promised to continue tackling local government debt, among other efforts, and on Thursday vowed to help state-owned enterprises «leverage and cut debt … and to repay their bonds on time this year». Chinese officials have said Beijing’s air quality improved sharply in the winter of 2017 and heralded their efforts as a «new reality» for the country.